Further details on some of the Pennsylvania dead. The report on JC’s Dream says he was euthanized for a broken carpus at Penn in February; adding, he had “just come in from a training center – very thin, very lame,” and that he had “never worked here [at Penn] – too lame.” However, according to Equibase, JC had been raced at Penn only one month prior (January 17, in a $6,250 claiming race). Curious – and, of course, animal cruelty defined. Blow By, a 3-year-old filly, died in Barn C, Stall 95 at Presque Isle in May. Cause of death: “pneumonia” and/or “possible head trauma.” The report adds: “horse was disposed of off property prior to examination by Commission Vet. No blood sample was collected.” Incidentally, prior to dying, Blow By had been whipped three times in maiden claiming races: last, last, second-to-last – a combined 87 lengths back. The death of 4-year-old Riot Squad on July 8: “Horse was down and thrashing.” “Humanely destroyed” for being “terminally ill.” At four. July 16 (at Presque Isle) – “heart attack/cardiac failure.” Dead. Rough Road Ahead died of “cardiac arrest” while training at Presque Isle in September. On the day he died, he was ten and had been put to the whip 69 times – most recently in an August $5,000 claiming race at bottom-of-the-barrel Mountaineer. In that race, he finished 9th of 10, earning $66 for his people. Huff’n Hughes “collapsed and died” while training at Parx in October. This, after six years and 78 (mostly claiming) races. It’s just so painful and heartbreaking to read the details that Patrick has provided here. There’s no escaping the fact that this is animal cruelty. It is utterly unacceptable. Any decent person on reading this evidence would be repulsed and disgusted. The horseracing industry has blood on its hands. 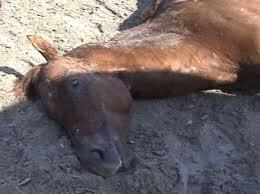 The deaths of these innocent horses is constant and ongoing. Yes, Carolyn I feel so sad for these unfortunate horses. I’m utterly dismayed that people get away with such blatant animal cruelty. Nobody will touch this issue because of the money and the power this business wields. But, the NW logging industry was shut down in spite of the money and jobs it generated. In fact, many small towns were left stranded. I would guess the logging industry did not have a strong enough lobby and did not “help” the politicians enough. I suppose the endangered spotted owl (the rallying cry for the opposition to the industry) is more important than the ongoing outrageous cruelty the horses are forced to endure. If the right pockets are lined anything can be done ! The horse racing industry hires public relations firms, lobbyists in Washington, and meets with politicians on a regular basis. It’s our duty to educate the public on what’s going on behind the fancy façade. The PETA video of Steve Asmussen’s barn was a good start that exposed the business as usual operations in a typical race stable because, over the years, the industry has consistently disputed blogs and voices claiming them to be an exaggeration. They couldn’t dispute a video nor blogs like this that state the horrific facts of horses dying every day. I attended a social event last week that was attended by, predominantly, the younger generation. Most of them didn’t even know what the Kentucky Derby is, and for those who did they said they will shut down horse racing, that it was an abusive business. So we have made progress in exposing this industry for what it is, and for what it isn’t. Now, all that we need is one of these young folks to get into public office, and stop all financing to horse racing purse money. It’s a fact that the horse racing business can’t survive without outside financing. Glad to hear that, Gina!…about the younger crowd knowing nothing about the KD! This antiquated industry’s demise is long overdue! So heartbreaking. Over and over…but “they” don’t see it for it is, because they choose not to. Those of you who can read this sickening news every day and still stay in the fight are my heroes. I want to curl up in a ball in the corner! Thank goodness I have or had La Parita (RIP), Tamarack View (RIP), Face the Fire, Jitterbug Jane and Joe’s Penny to keep me going. It’s always “follow the money”, honey! So true. These politicians are receiving huge financial donations from the horse racing industry. Money talks. It’s now up to the taxpayers to talk, and educate. The majority of taxpayers, and casinos no longer want to support this cruelty circus. The industry knows full well that it doesn’t matter what the taxpayers think and they go straight for the jugular vein – the politicians. Once they have them in their pocket those politicians will vote to support horse racing and the majority who opposes it gets left in the dust. Yes, the Decoupling law that looked like a shoe in is being virtually stopped by the financial contributions of the pro horse racing industry. However, the demise of this industry is inevitable. Of course I would like it to end today, but it will end. So many factors that will end horse racing, and they can only pay politicians for so long because sooner or later there will be a honest politician or a politician that will stop horse racing – one that they can’t buy. There are many factors that will contribute to the demise of this industry. One is the younger generation. The majority don’t want to support this cruelty circus. Another is the shortage of slave labor. If it wasn’t for the continuous supply of (possibly illegal) immigrant labour they would have no help to take care of their million dollar horses. Of course the biggest factor is financing. This business can’t survive without financial handouts from the taxpayers, casinos, or whoever else they can leech off of. So the 3 most important factors to shut down this industry is the following: 1. Cancel the Interstate Horse Racing Act. 2. Pass Decoupling in all states. 3. Educate. Some other things that should be made mandatory is complete financing of ALL thoroughbreds when done with racing. If the industry was legally made to be held accountable for their athletic slaves then they wouldn’t survive. In all the ongoing discussions never once is the environmental impact of this industry ever addressed and that’s probably because their paid politicians ensure that it isn’t. The caustic chemicals being seeped into the water system, the run-off from the manure, and the biggest environmental disaster is the slaughterhouse where many end up. When somebody smartens up and starts to sue the racetracks for seeping pollution into the water system then it will hopefully open up endless possibilities to finally shut this cruelty circus down. I’m very confident that this cruelty circus will end or be reduced to nothing. It’s just a matter of time. Whether I see it in my lifetime remains to be seen, but on a positive note I’ve seen this industry become very eroded, and reduced since the 60’s so there is progress being made. Sadly, the racehorses are paying with their lives for nothing more than greed.